Time is the most important thing in life. In North America, we’re taught that you work hard until you’re around 60, 65 or 70 years old and then reap the rewards of retirement afterwards. Doesn’t that seem strange to start living your life during an age when one’s body and mind are no longer at the optimal state? It simply might not be possible to do that epic trek you’ve been dreaming about, or that scuba diving certification you’ve wanted to complete. We receive a lot of emails and are frequently asked questions in our Facebook group about this exact topic. People either want to find travel jobs and work abroad, or they simply want to retire early and not work any longer. The trend among our emails is that you (our readers) want to really start living – sooner rather than later. Thankfully, these days it’s possible. Note: this article is meant to be inspiring and useful. I realize that it might not feasible for everyone to quit their traditional jobs and lifestyle due to various personal (or medical) circumstances. But, I’m assuming that since you’re reading this post that you’re interested to find out more and are considering it! I hope that for those of you who are already considering a life of travel, you find some answers in this post. It’s normal to be nervous and have some doubts and fears about changing your lifestyle to include more travel, but trust me, it’s possible. 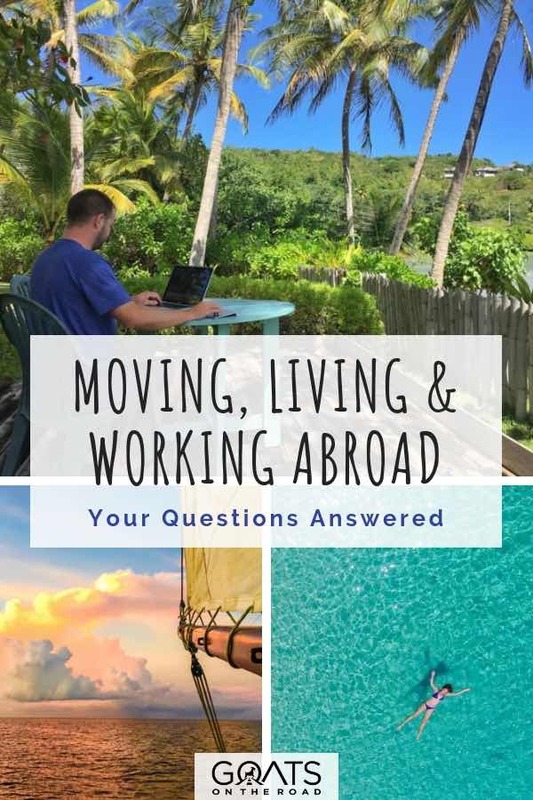 Going against the grain and living unconventionally is what we’re all about and in this article I’m going to answer many of your logistical questions and address your concerns about turning travel into a lifestyle – including moving, living and working abroad. These are real questions and doubts that are taken directly from emails we’ve received, or that we’ve been asked on our social media accounts. This is the most common question we receive, and it’s a fair point. People are interested in pursuing a freedom filled lifestyle, but they have no idea where to start. In our experience, the first step is truly wanting a new life and breaking down any mental blockages you may have surrounding the change. Know that if you take the plunge and are following your true path in life, everything will work out and fall into place. You’ll need to decide where you want to travel / live – this will depend on your budget and things you’re looking for in a new home. Sit down and think about what it is you want from your new life. Do you want to be near the water? In an exciting city? Would you like mountains nearby? 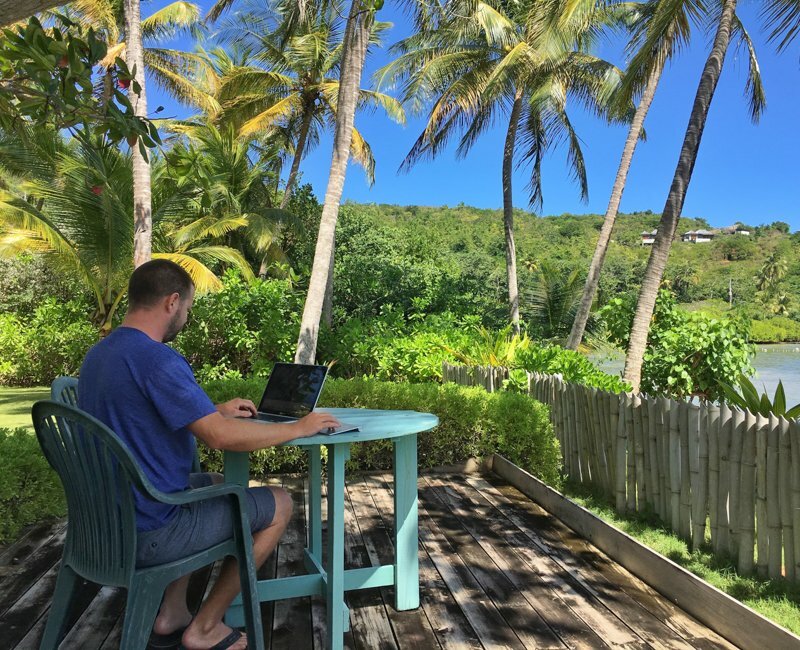 There are numerous visa free countries and digital nomad hot spots if you’re planning on working abroad and be surrounded by other entrepreneurs. 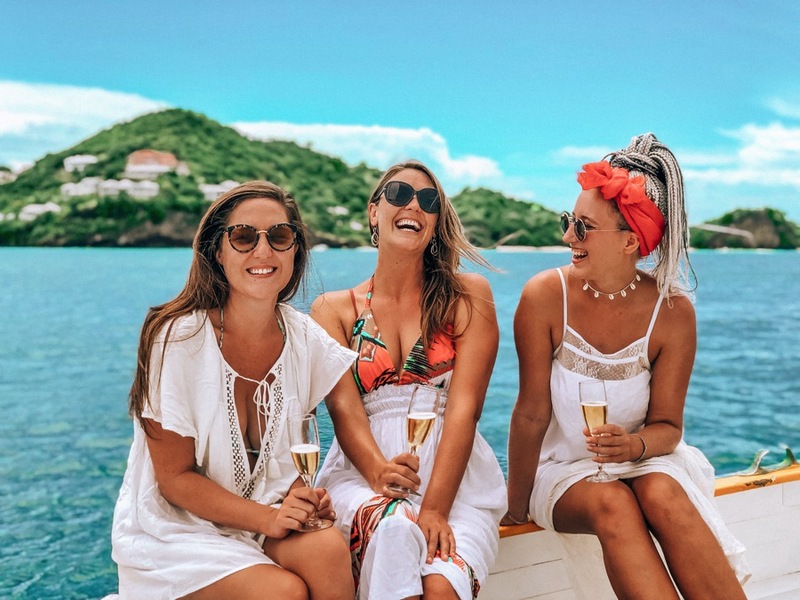 If you don’t have a job yet, and are travelling off of savings, there are lots of cheap destinations you could visit first while you look for work, in fact, you can even live and travel for a year on as little as $5,000. Take some time to properly plan, research and save money before departing. Then, purchase a flight ticket. Once you have a destination in mind and have done some sufficient planning and saving, you then need to start working towards minimalism – by this I mean, purging your stuff and not buying anything else. 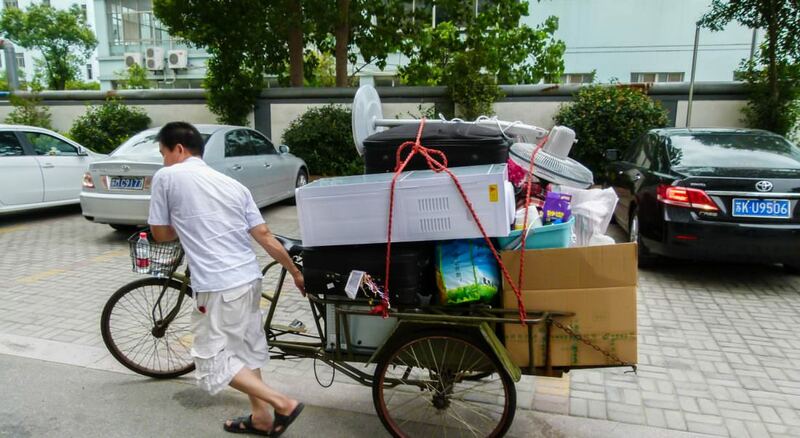 Our moving day in China – that’s all we owned! Sell things of value and give the rest away. Go room by room in your house, item by item, and decide whether or not you really need it anymore – chances are, you don’t. Figure out what you’re bringing with you and put the rest into storage. Ideally, you have friends or family with a basement or room in their garage where you can store your items for free. Once you’ve reduced your possessions, planned, packed and saved, there’s nothing left to do but say goodbye (see you soon) to friends and family and jump on a flight to your new life! Of course, this is a very brief summary of what needs to be done in order to move abroad. There are some other useful articles of ours below. Our website attracts a wide variety of ages. This past month, 20.87% of our readers were between the ages of 45 – 65+, meaning you’re not alone if you have this question and you’re reading this blog! There are numerous people in your age bracket who are considering retiring early, becoming semi-retired and working abroad, or at the very least, taking off for a year or so to give it a try. The dream in Canada used to be “Freedom 55” meaning that if you worked hard, and invested smartly, you could retire by the age of 55. In truth, very few people are able to retire so early, but the internet and travel jobs are slowly making this dream become a reality again. Depending on what your current career is, you could try to do it remotely. These days, work doesn’t have to be a place and there are numerous jobs that can actually be done either from your home, from a cafe in Rome, or from a beachfront villa in Thailand. The point is, if you have one of those careers, speak to your boss or management about taking your work on the road. There are some inspiring people in our Turn Travel Into A Lifestyle Facebook group who have done this and even though they were expecting a firm “no” from management, it turned into a “yes”. 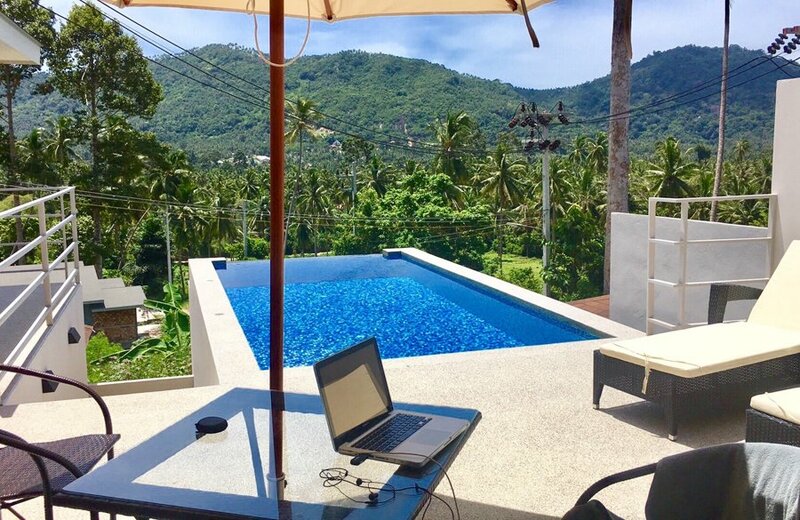 On a personal note, one of our parents actually lives full-time in Mexico and is semi-retired, doing their same job, but remotely from an oceanfront “office”…aka, their deck! How amazing is that? You’ll never know if working remotely is possible if you don’t ask. For those who are interested in working abroad while doing a different job from the one you currently do, you are never too old to learn new things. If you’re a native English speaker, maybe teach English online, or actually move to another country to teach. You can find teaching jobs in China if you’re interested (and qualified), and if you’re from Canada or the USA, you can become a VIPKID teacher online. If you’re savvy with technology or if you are willing to learn, the possibilities are endless. You can become an online coach advising people on a topic that you’re knowledgable about. You could edit videos for “vloggers”, run social media accounts, do some copywriting, get paid to write online with freelance gigs, design logos, become a virtual assistant, or start a travel blog and work for yourself. If you are bilingual, you could also consider some translation work and editing. Truthfully, there are too many travel jobs to list. Click here for more. If you’re someone who wants to retire early (and not work abroad), if you have the means to do so, go for it. Sure, you’ll probably take a hit on your retirement funds, but as I said in the beginning of this post, time is your most valuable asset! Consider the cost of living in your home country vs. the cost of living abroad in a cheaper destination. 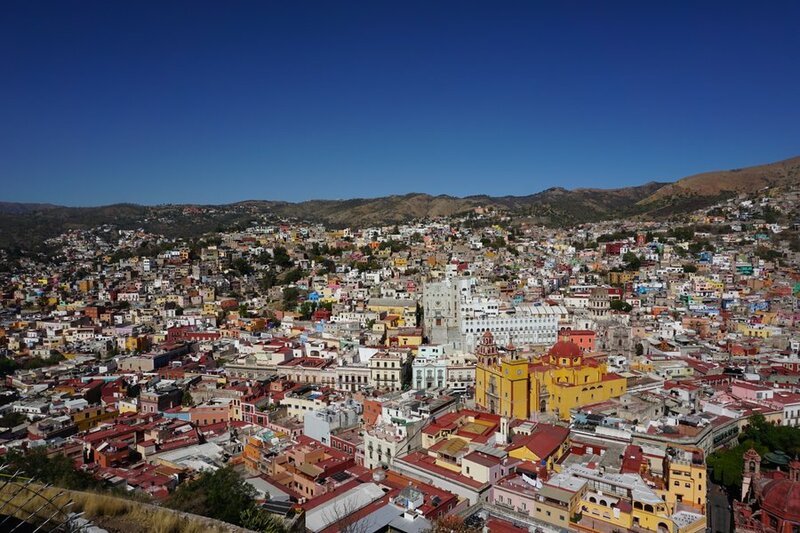 You’ll probably find that you can live a better life for half the price if you move abroad and live off of your retirement earnings, and still have some funds left over. 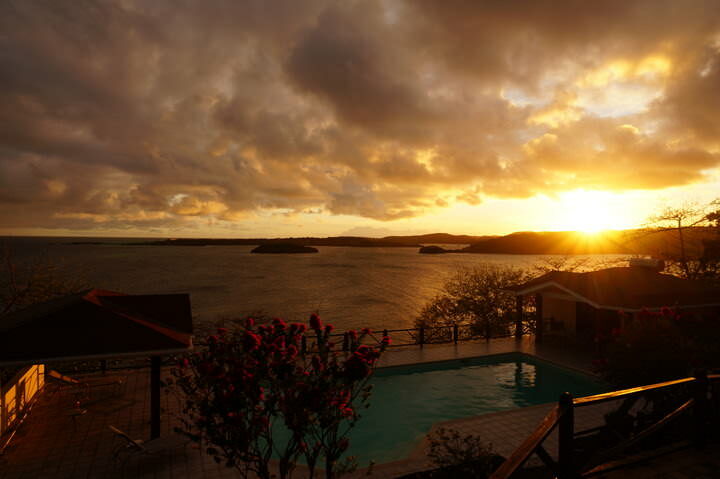 Click here for a list of destinations that offer a low-cost of living. Another option is to find a house sitting job / pet sitting job and enjoy living abroad as a local, while receiving free accommodation. As Canadians who are non-residents of Canada, we don’t receive health insurance from our country anymore. We need to purchase “expat insurance”, and the costs vary depending on where in the world we are. If we’re in the USA or Mexico, the cost is higher. As an example, for $500K coverage, for a one month policy, we paid $94.85 USD ($123 CAD) each. If we’re anywhere else in the world, the costs are less, but of course, health insurance costs depend on how old you are and any previous health conditions. We go with Allianz Travel Insurance for our expat insurance. Finding accommodation abroad is easier than you think. 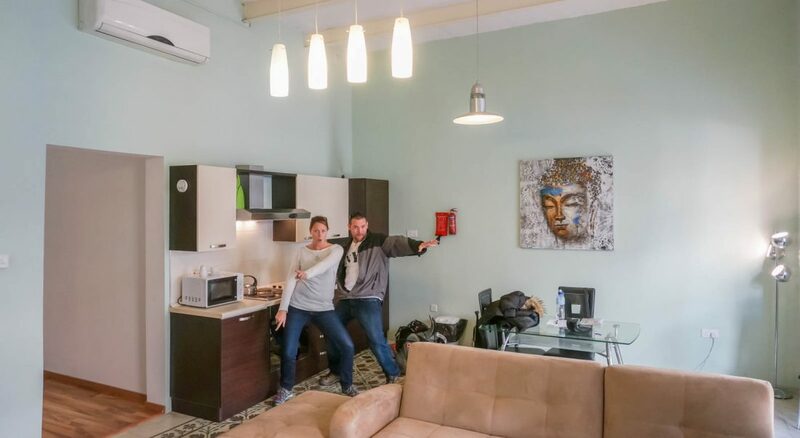 We’ve rented incredible villas in Canggu Bali and Koh Samui; apartments in Buenos Aires, Sliema, San Pancho and Yangzhou; and even a lakefront casa on Lake Atitlan, Guatemala. This is one of the best booking platforms to find apartments, houses, villas and unique accommodations for rent. With real reviews from customers, and a secure booking platform to help deal with any issues you may have, it really is the best. Owners typically offer a reduced rate for long stays of 1 month or more, and you can also chat directly to the owner through Airbnb to work out any extra discounts. You can get an Airbnb coupon for $25 off your first booking – bonus! If you book directly through the platform and choose owners with high ratings, you won’t have any issues. However, it’s important to be aware that there are some Airbnb scams online. We’ve used Airbnb for a couple of long-term stays, and also for numerous short stays of 1 week or less and we love it. This is fast becoming a way to find accommodations around the world. 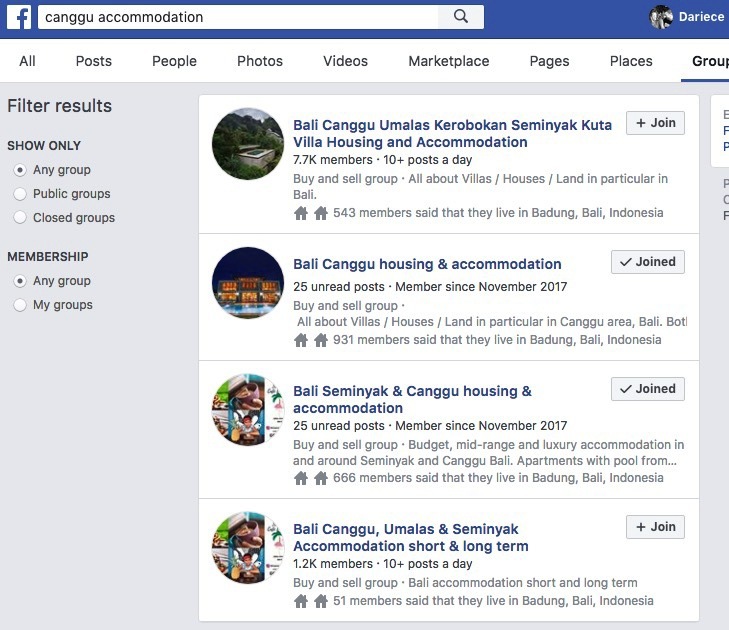 If you know where you’ll be moving to, all you need to do is go onto Facebook and search for expat and accommodation groups. I typed in “Canggu accommodation” and that’s what showed up. Of course, you can change your search terms to include words like “community”, “expat”, “housing”, “for rent”, etc. Just be aware that when booking through an individual rather than a company like Airbnb, there’s no recourse if something goes wrong. When booking through a company or individual on Facebook, I recommend to always see the place in person before committing. While you’re checking out the places in person, you can stay in a hotel, guesthouse, or apartment. We always book with Booking.com or Airbnb. The first few search results will most likely be websites like Airbnb, Expedia and Booking.com, but after that you should see some local real estate agencies. Sometimes the agents will charge a fee, so make sure you get all of the information up front. We loved our apartment in Malta! If you know someone who is living where you plan to move, or they’ve lived there in the past, ask them about apartments for rent. More often than not, they’ll know of a manager or will have a contact for you. This has to be the ultimate way to find long-term accommodations. With house sitting jobs, you typically have to take care of an animal (dog, cat, fish, etc. ), but not always. When people go away for a month, 6 months, a year, in many cases they can’t bring their furry friends with them, or they simply don’t want to. This is where you come in. You live in their home for free and in exchange you take care of their pet(s). Oftentimes you’ll receive a vehicle for your use, and even a salary. 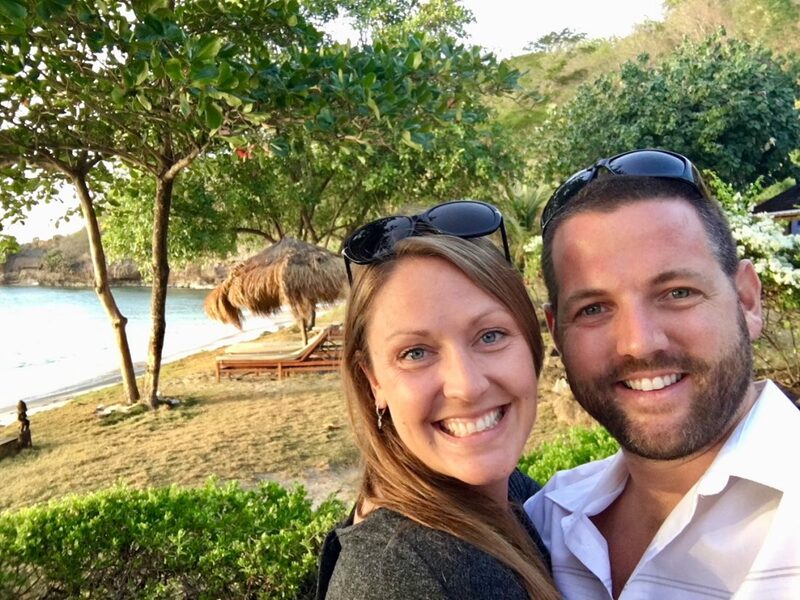 We’ve had pet sitting jobs for 6 months out of the year for 3 years in a row in Grenada. We also pet sat for 2 months in Barbados and 2 weeks in Costa Rica, plus we’ve been offered many long-term sits that we weren’t available for. This is another valid question, and is definitely one of the top ones we receive. People often think that we’re just a couple of millennials who don’t have a plan for the future. And, while we don’t like to plan, we do have somewhat of an idea for our “retirement”. The Government and Financial Advisors both have incentives to keep you working and keep you in your home country. This is so you’ll continue to work for as long as possible, so that when you eventually do retire, there are fewer years left on your life for the Government to have to pay you for (morbid, but true). Financial Advisors want you to keep paying their salary instead of moving away, retiring and never talking to them again. 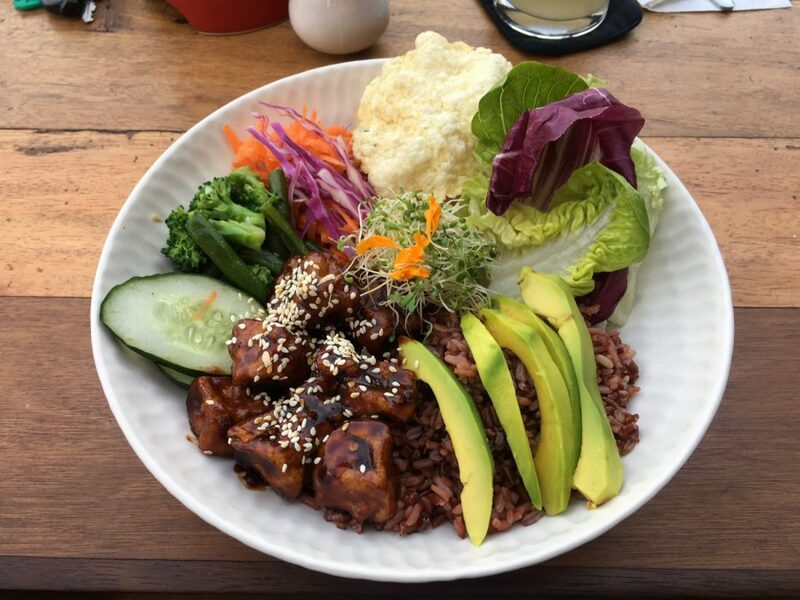 Tasty (and filling) tofu, rice and veggie meal in Bali for $3.80, which was considered expensive. Meals can be had for $1. When we lived and worked in Canada, we were taxed 40% of our earnings. We then paid money into our CPP (Canadian Pension Plan), and whatever was left over, we took home. $8,221 Canadian dollars in a year really isn’t much to live off of. The amount of money we earn from this website is more than double what we earned when working in Canada. Because of this, we’re able to have savings in the bank for when we’re older – far more than we would if we relied on traditional methods such as CPP and RRSPs. Plus, since we’re living and working abroad, we are able to enjoy a freedom filled lifestyle. Plus, we practice what we preach, which is finding ways to supplement our earnings. We’ve taught English (and could do it again if need be), and although we’re currently renting by choice, we are house and pet sitters which means we can live for very little each month if we want. There are also numerous countries where one could live on very little money. We definitely don’t worry about being 80 and not having enough money for assisted living. Yes! There are lots of jobs for those who aren’t native English speakers. However, if you want to teach English, you will need to speak English as a first language. Consider registering yourself on a freelance platform such as Teachable and receive online jobs through there. If you are bilingual, you can teach your language to English speakers (or other language speakers), on Italki. They say money can’t buy you happiness, which is true, but it’s also true that you need some money in order to move abroad and be happy! During the planning and preparing stages, make sure to do some saving as well. We don’t recommend that people quit their jobs and move abroad with just $100 in the bank. We feel it’s important to have a small nest egg to back you up until you find a job – or, to fall back on if need be. If you don’t have a remote job lined up yet, we recommend saving around $5,000 USD before hitting the road. We also suggest starting a blog before you head off as it could potentially start earning you money within a few months. In inexpensive countries, you can live for around $650 / month including accommodation, food, transport and entertainment. So with your savings, you should be able to live for around 7 months abroad. In order to have a continuous income each month so that you can work abroad and live abroad full-time, you’ll need to have a financial plan in place. If you’re retired, you’ll have an income coming in from the Government and whatever investments you may have, and depending on which country you choose to live in, that may be enough to cover all of your expenses…and then some. If you own a property and rent it out you’ll be earning an income from that. If you have neither of the above, it’s time to look into some travel jobs that you can do on the road to make money. Work on a cruise ship, become a scuba instructor, be a social media manager, become a photographer, run your own tours, have an epic YouTube channel, teach online, be a yoga instructor, pick grapes, pick fruit and vegetables, etc. 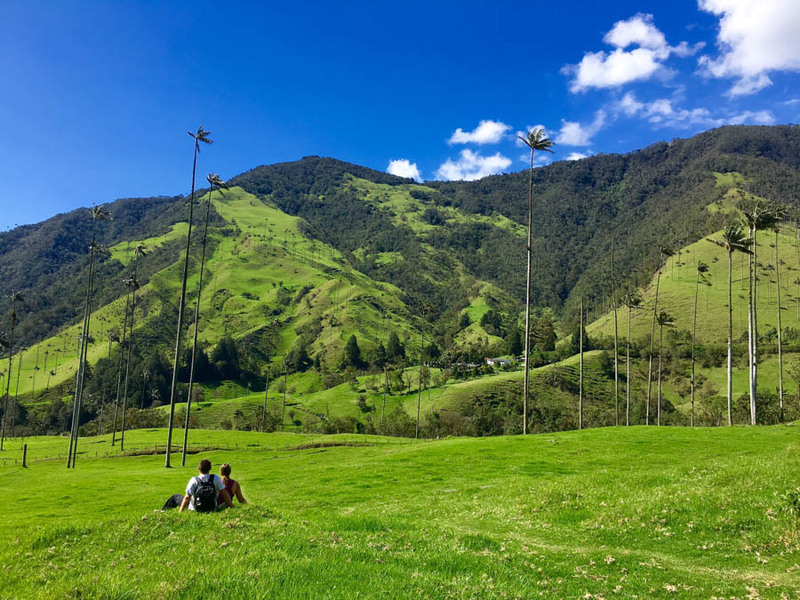 Again, in order to supplement your income at first, you should opt to live in an affordable destination, do some house sitting, or consider some work exchange programs such as WWOOF and WorkAway. First, try to get a surplus of the medication you need so that you’ll you have a back-up. Bring a letter from your doctor, and a prescription for a refill of the medicine you need while you’re abroad. If you’re travelling in destinations in North America, Europe, Australia or some places in South America then you might be able to find the medication you need (in some cases even easier than at home). But, in many cases, you won’t be able to get the pills that you need while you’re abroad. It’s a good idea to give someone back home power of attorney to allow them to act on your behalf and receive medication for you. Submit prescriptions to your pharmacy at home and have your contact fill them, and collect them on your behalf and FedEx them to you. For more information on this topic, click here. People will criticize you if they are jealous or envious of what you’re doing. And these days, with the internet, people can do that anonymously, meaning it happens more often. Just ignore it and go about your business and the lifestyle you chose. You’ll attract people to you (and your business) who are like-minded and interested in what it is you have to say and offer. Be true to who you are, be genuine, be positive and keep moving forward. Let the negativity bounce off of you! This is something that many people struggle with when they start working abroad. It’s so hard to get used to not having a routine! If you’re working at home, you go into the office at around 8:30am, lunch is at noon, and you finish at 5:00pm. When you’re working abroad for yourself, or if you’re working remotely, you don’t have to physically go to work, unless you want to. In order to make sure you are able to stay on task and be productive, you can always join a co-working space. These are incredibly popular for those digital nomads wanting to be surrounded by a community of people. Co-working spaces have proper tables and chairs set up, they offer fast internet, there will be a coffee area and sometimes food is available. For those who are having to deal with time zone changes, many are open 24 hours. This is a great way to meet people who are also living abroad while working online. And, quite often, there will be free seminars or events that you can join. Other ways to find a community while you’re working abroad is to (again) search on Facebook. This time search for terms such as “digital nomads in ___”, “___ community”, “Expat groups in___”. You’ll see below I searched “Budapest Digital Nomads” and found a group. Being a part of various groups and co-working spaces is a great way to keep you motivated and accountable for any work goals and deadlines that need to be met. 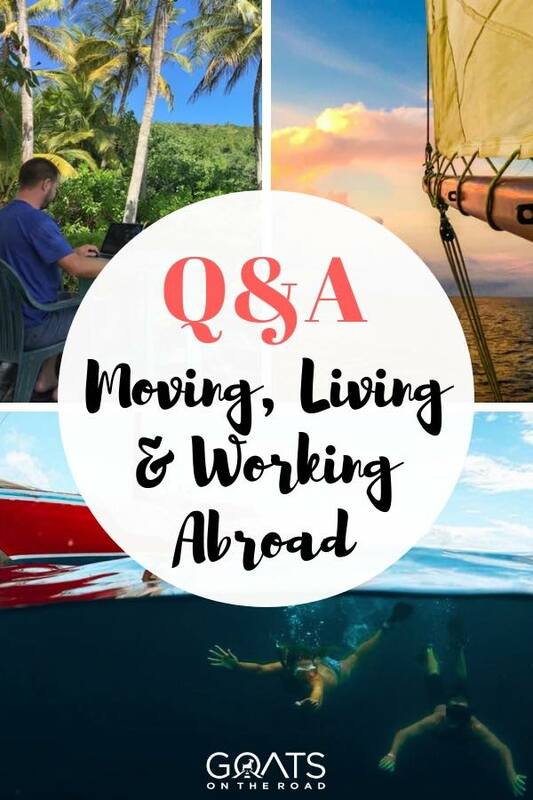 Ready to take the leap into a life of living and working abroad? For us, we can’t imagine our lives any other way. That’s why we’re constantly praising and recommending this lifestyle to our readers, and people we meet along the way! 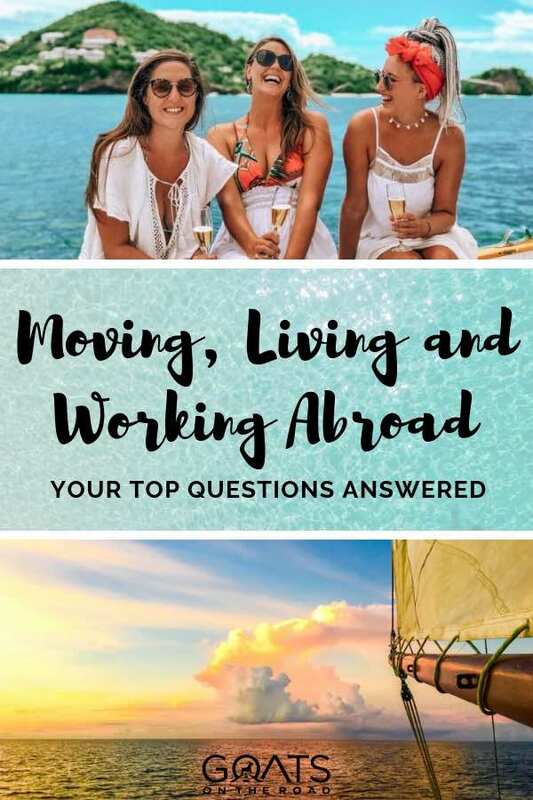 There are numerous ways you can make money abroad, but the hard part is getting over the hurdles you create for yourself. Be brave and take the leap. If it doesn’t work out for you, you can always return home. These are some really practical questions that people all across the globe typically have in their minds. Your answers are really detailed and helpful. I wanted to know about long-term accommodation options abroad. Airbnb, as suggested by you, is good. I have tried it a couple of times for my stays. Thanks for all the helpful advice. As an American how do you stay in another country past the 6 months some allow for being a tourist?